Happy Cinco de Mayo! 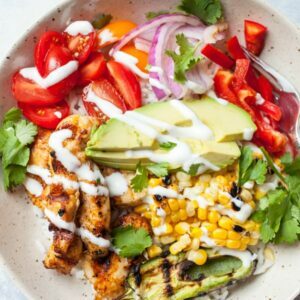 If you are still looking for something to make, look no further than these easy Grilled Chicken Burrito Bowls! 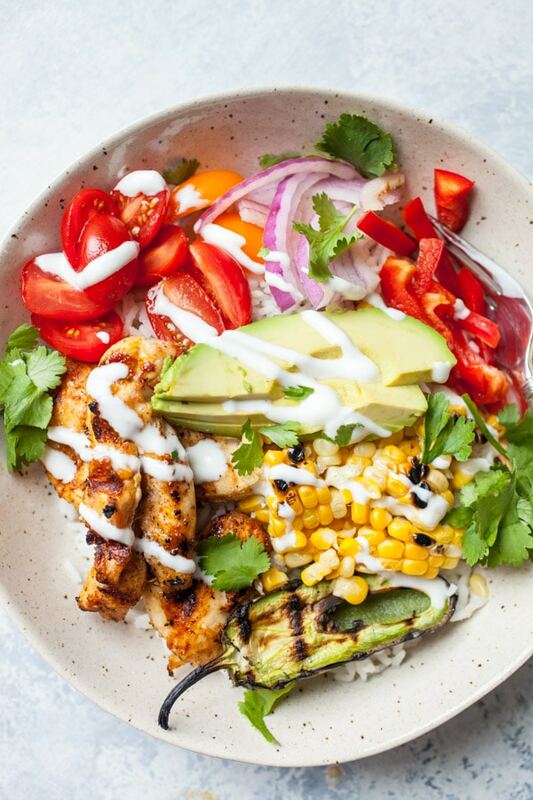 These burrito bowls are packed with perfect, grilled chicken, nicely charred veggies and plenty of additional vegetables and desired toppings like sour cream and avocado. I realize that the ingredient list on this recipe is a bit longer than I would normally post, but the ingredients are all simple to find, and the nice thing about these bowls is that you can totally customize them to your liking. If you want, you can skip the rice and serve it over lettuce instead. Feel free to skip the crispy corn strips, although you can make them in advance and they may just be my favorite part. 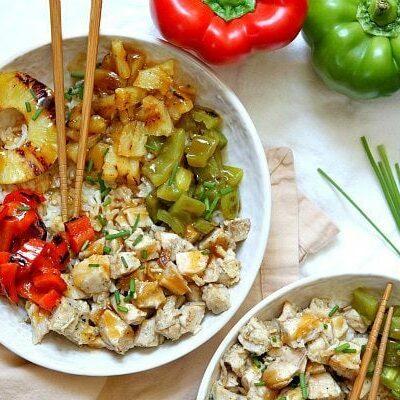 The nice thing about these bowls is you can easily feed a crowd by prepping everything in advance, tossing some chicken and corn on the grill, and letting people assemble the bowls to their liking! To dress up the rice a bit, I just cook normal white rice but then toss in some lime juice, cilantro, and salt to make the flavors a bit more unique. The Cilantro Lime Rice part of this recipe is also terrific served on its own with other dishes! 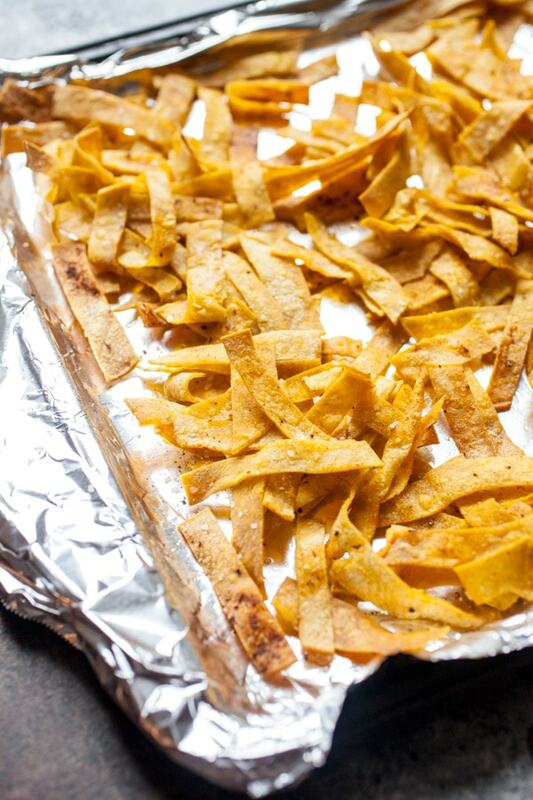 And the crispy corn strips are simply cut up tortillas tossed with spices and baked quickly in the oven. You could always toss in some plain, crumbled tortillas chips instead… but I fully recommend making these. They’re so good! 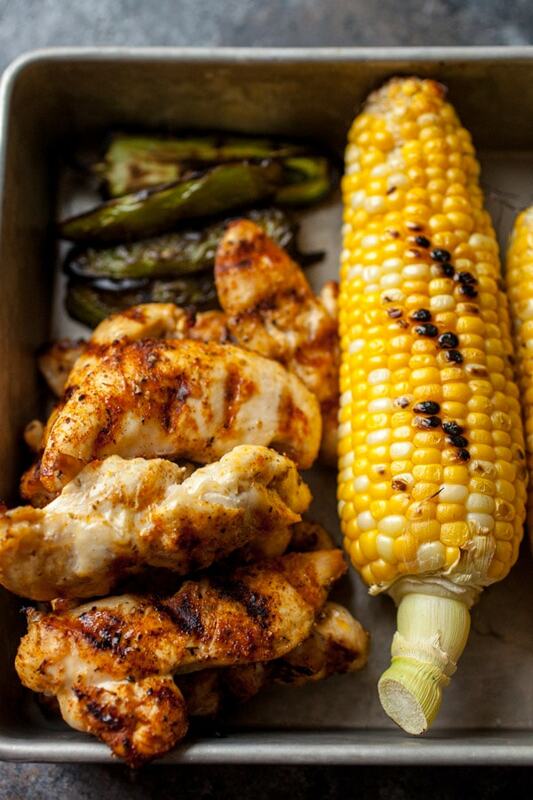 On the grill, I like to add the chicken, corn, and a few jalapenos for extra spiciness. Again though, make it your own! 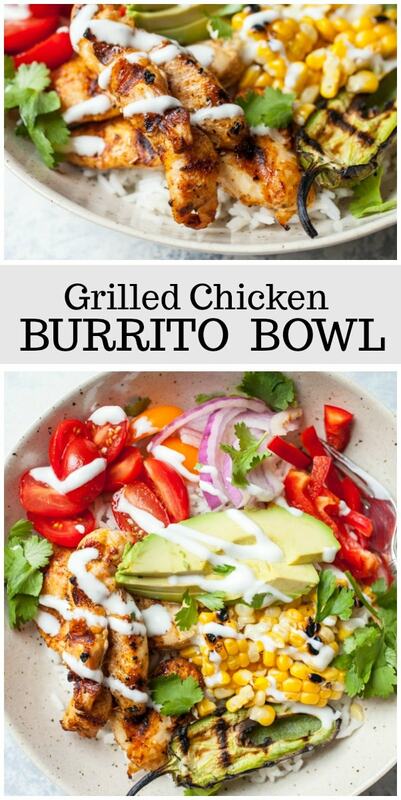 These are all great additions to the Grilled Chicken Burrito Bowls. Making the bowls are fun and easy once you have the pieces together. Add a rice base, add some chicken strips and corn and top with any and all veggies your heart desires! 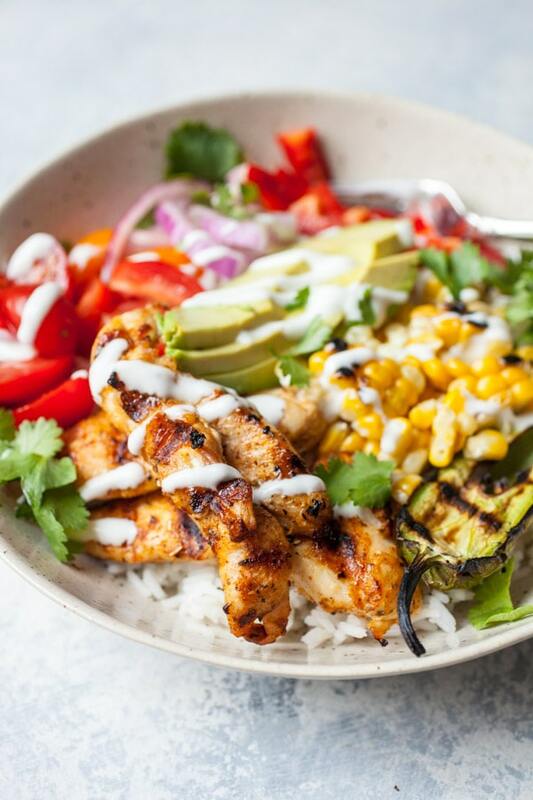 Drizzle on a little sour cream and/or salsa and you are in for the perfect Cinco de Mayo Grilled Chicken Burrito Bowl! These easy burrito bowls are a simple way to add some Tex-Mex flavors to your grilling game! Cook the rice according to package instructions. 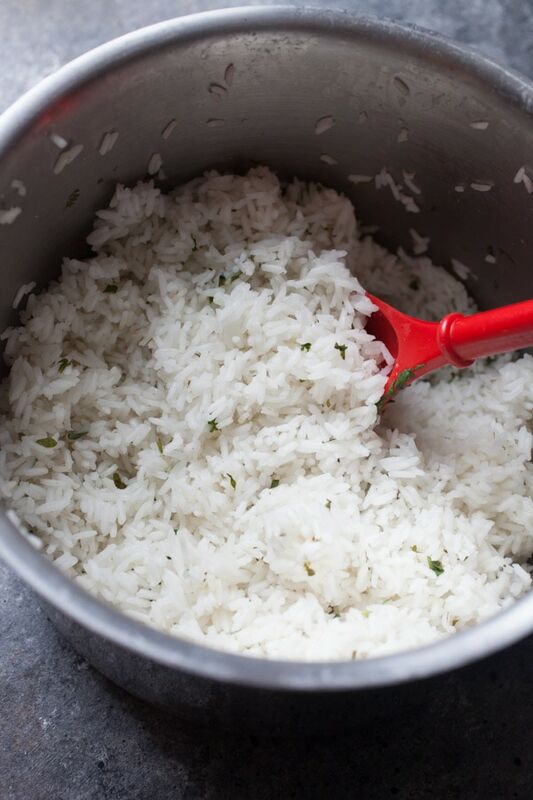 Drain when cooked and add lime juice, cilantro, and a pinch of salt to rice. Let steam for a few minutes and then fluff with a fork. Set aside. Preheat the oven to 375 degrees F. Slice corn tortillas into thin strips and spread out on a baking sheet. Toss with olive oil and spices. Bake for 10 to 12 minutes until lightly browned and crispy. Stir once halfway through to ensure even cooking. 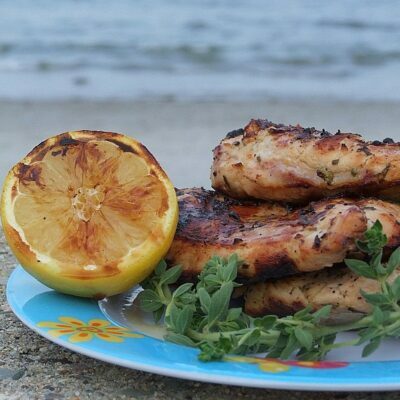 Drizzle with olive oil and toss with spice mix (salt, pepper, chili powder, garlic powder, oregano). Grill over medium-high heat for about 8 minutes until cooked through. I recommend grilling the sweet corn and jalapeños at the same time! Add rice to each bowl. 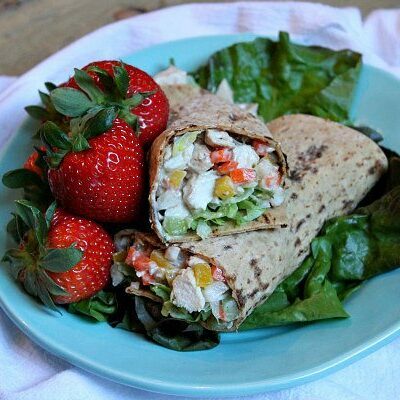 Top with a few chicken strips, crispy corn strips, veggies, and a drizzle of sour cream. 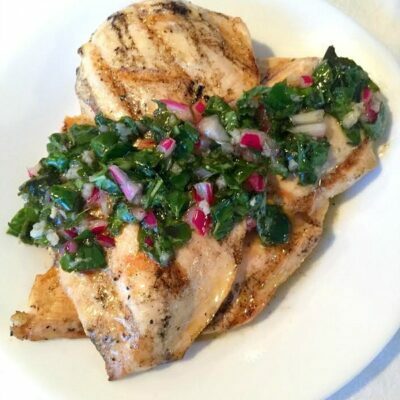 Garnish with fresh cilantro! Serve immediately! Is this correct in that there are 881 calories PER bowl? Yes, if you divide it four ways. Lighten up by using less olive oil, light sour cream, not as many tortilla strips, Cauliflower rice in place of white rice, no avocado etc. I love the recipe! Love the mix!